Is the entry door of your home an eyesore? Is it not properly insulating your home from the outside elements? Does it require constant upkeep, such as a fresh coat of paint on a regular basis? 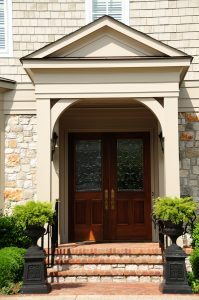 If so, it may be time for a new front door, one that truly boosts the curb appeal and energy efficiency of your home. At Majors Home Improvement, we install fiberglass replacement doors from our Majors Select™ line of entry doors for our customers in Crestview, Florida, and surrounding cities. Even better, you’ll be able to customize your new replacement door with doorlites and hardware to ensure it meets your every need. And, when you work with Majors on a door installation, you can feel good knowing you’re entrusting your project to the most capable hands. We hold an A+ rating with the Better Business Bureau and a five-star rating with GuildQuality, as evidence of our commitment to customer satisfaction. We also provide Red Carpet Service for our customers, which means we’ll be professional when working in your home, mindful of your landscaping and pets, and precise when installing your new door. We’ll also keep in constant communication with you to make sure you always know the status of your project. If you’d like to learn more about the replacement doors we install for homeowners in Crestview, FL, contact Majors Home Improvement today.